International yoga teacher Kali Basman (kalidurgayoga.com) enriches the paradigm of Yin Yoga to integrate distinct aspects of Self into an innate wisdom practice to awaken a rich inner life and radiate with ritual. Her offering honors Yin Yoga as a tool to surrender to our intrinsic wholeness. On the textured path of mindful healing, Kali is celebrated for her integration of the 5 Elements and Chinese Meridian Theory with self-inquiry, embodied Anatomy, Buddhist Philosophy of Equanimity, and sharp intellect. WANT TO PRACTICE WITH KALI? Learn more about her upcoming 5 Elements Yin & Restorative Yoga Teacher Trainings. The ‘Repose’ in Yin Yoga practice is used as the thread, or the ‘Sutra’, between carefully curated asanas in a Yin Yoga sequence to allow the system to come to a state of ease and decompression in between each shape. Think of it as a mini-savasana in between each posture: The magic of stillness here allows for an observant practitioner to absorb the subtle significance of the preceding posture, and to soak up the benefits of the shape, before flowing onward to ‘what’s next!?’. Yin Yoga is a practice of honoring transitions, the space in between transitions, and the precious potency of the present. One crucial objective in a conscious mindfulness embodiment practice such as Yin Yoga is the devotion to simplification. In Yin, when we no longer can rely on the normative patternings of stimulation and chaos, movement and turbulence, we are forced to get down to the bare bones of the practice: a system in stillness, and a body of breath. By keeping movement to a minimum (letting the stimulation of Vinyasa- or FLOW- to be reserved for a more YANG practice), we assume a minimalist aspect: to renounce the rest of the world and just take refuge within the shape you’re in. In Tibetan Buddhism, the concept is referred to as Nekkhama: to Renunciate. As you lay down and become enmeshed in quietude, the subtle realm becomes more pronounced and externalities sheathe away. All that’s left is the beckoning will to draw inwards. Choosing a pentacle repose is a radical renunciation – a different way of being in the world: more refined. It’s quite phenomenal to simplify and surrender enough to become unhinged from the normal turbulence your system learns to rely on. Without this preoccupation, you can learn to deeply love where you are right now. International yoga teacher Kali Basman enriches the paradigm of Yin Yoga to integrate distinct aspects of Self into an innate wisdom practice to awaken a rich inner life and radiate with ritual. Her offering honors Yin Yoga as a tool to surrender to our intrinsic wholeness. On the textured path of mindful healing, Kali is celebrated for her integration of the 5 Elements and Chinese Meridian Theory with self-inquiry, embodied Anatomy, Buddhist Philosophy of Equanimity, and sharp intellect. ON YIN & THE GREAT WITHDRAWAL FROM THE EVER SHIFTING SENSORY REALM. Yin is a helpful container to practice PRATYAHARA: Withdrawal of the Senses, or as I like to call it ‘The Great Withdrawal’. Teaching in Los Angeles, I see studentship enter the studio with a flurry of externalities, a contingency of chaos, and filtering through the debris of life in constant motion. The goal of a Yin practice is to allow the system to settle into stillness so true cellular regeneration and deep tissue restoration can occur. However, modernity implies that the availability of stillness and spaciousness is intermittent at best. The city sweeps you through its streets, the to-do list mounts, and in the midst of progression and productivity there is rarely time for the dust of the subtle realm to settle. With that in mind, my objective in offering Yin Yoga as a daily foundational practice is not to demand that the practitioner set aside the perfect amount of space and time with complete clarity of mind. The objective is this: to train the nervous system to become comfortable with the ever-shifting state. There may be space between the thoughts and between the breath in some moments, and in others we may succumb to the normative patterning of clinging and cluttering the foreground of our mentality. Either perspective is part of the process. We might inquire - How do I extricate myself from the onerous paradigms of an involved and often overwrought life? Where and how is stillness accessible to me, even in the midst of movement? I use Anahatasana (Melting Heart) as a way to observe the threading of breath along the length of the spine, supported by a still and stable base of skeletal alignment of pelvis and femur bones. This shape encourages us to seek stability and spaciousness even in the midst of a turbulent breath. In terms of Yin Asanas, this one has quite a Yang elemental texture to it – there is activity, there is muscular engagement, and yet – there is the propensity to experience a subtle sweep of deep, still, quietude – if even for a brief and fleeting moment. Note: There are many resources online which point towards the proper cueing, entering and exiting the shape, contraindications and modifications. I encourage you to explore those on your own accord – the thrust of this post is not to cookie-cutter the shape for you, but rather to offer some of the underlying energetic repercussions a refined relationship to this posture will provide. As the name implies, the structure of this shape allows for an energetic pooling at the locus of the heart as it melts off the spine, drips from the sternum, pools and puddles on the earth below you. What a delectable manner to settle! Arms outstretched allows you to lengthen the Heart & Lung Channels of the Traditional Chinese Medicine Meridians, stretches the lobes of the lungs long so that breath becomes more accessible in the backbody. This is a backbend for the upper thoracic spine, which tends to be the most inflexible region of the vertebral column. Repercussions of inflexibility here include rotator cuff rigidity and neck pain. The more mobility you have here, the greater flow and flush of prana and cerebrospinal fluids you have. I see a lot of hypermobile yogis electing the lumbar spine to bend deeply in mid and lower back. The lumbar spine should serve to stabilize here, so you can encourage a deep and therapeutic compression in thoracic. The weight of the pelvis should be balanced over the knees: another way of thinking of this is ensuring the length of the femur bones are directly perpendicular to the mat. This will allow even gravitational force to be distributed down the thighs, maintaining a foundation of stability. Slight engagement of the quadriceps along the inseam of the femur bones (think isometric magnetizing of the inner thighs towards the midline) will support stability… so that you may sink into stillness, even for a moment! Once stability has been realized, there is a way in which the YANG element of this shape dissolves into the somatic wisdom of YIN. You can unravel here, allowing the shoulder blades to soften and descend off the spine, the glutes melt off the backpoint of the sitting bones, and the expression of the face unfolds into a subdued state. WANT TO PRACTICE WITH KALI? Learn more about her upcoming 5 Elements Yin & Restorative Yoga Teacher Trainings. A still, intentional embodiment practice helps to soothe the fluctuations of a cluttered mentality and release the binding grip of muscular stress. Yin is the format we may use to withdraw from normative patterning of stimulation and let all the energetic build-up of the daily debris find a way to percolate through the system and be effectively released. Certain implications of stress emerge around the tops of the thighs and the bottom of the hip flexor – a critical fight or flight response when the system is in stress – and so a shape which lengthens the quadriceps and compresses the bottom insertion of the psoas is paramount to softening and widening the legs so we might settle into groundedness. I offer Virasana (Heros/Saddle) as a way to internally rotate the femur bones and lengthen the quadriceps to slough off mounting tension from thighs and lower hips. You can choose to keep the spine erect or enter into a more intense embellishment of the shape with the spine on the ground. This is an intense, acute shape: as such, within the immediacy of sensation there is the availability to observe somatic wisdom. Enter quietude to hear the wisdom – sometimes it speaks to you in a mere whisper. Settle The skeletal set up of the foundation for this shape is an internal rotation of the thigh bones and a compression of the front of the ankles as you settle the hips above the heels. The Kidney & Stomach Channels of the Traditional Chinese Medicine Meridians are engaged. Spread Generally speaking, an internal rotation of the thighs allows for a spreading of the sacrum. Thus, a stable base of spine allows for a therapeutic foundation to compress lumbar if you choose to move into a backbend. Arch If you enter the backbend by bringing the back to the ground behind you, you’ll experience a deep opening in sacral-lumbar region of the spinal column. Remember you are only as healthy as your spine is supple! Yin Yoga is a practice which encourages a softening or surrendering of activity and an observation of present moment awareness. Integrating the Chinese Five Elements into the practice enriches the paradigm of Yin Yoga as a healing modality, as we are each an embodiment of Earth, Fire, Water, Metal & Wood. During circumstances of imbalance, we can utilize the wisdom tradition of Yoga Asana to organize the skeleton and relax the musculature in specific ways which awaken and enliven gentle self-inquiry and a lubrication of the connective tissues and pathways for immunity, longevity, and vitality. In a world that’s ever shifting, may you use this practice to find stillness. In thought patterns which engender suffering, may this practice allow you to see the unity of all things, from the shifting of the seasons to the suppleness of the spine. When we are connected to the Earth there is a palpable sense of groundedness, a connection to the center of ourselves and the center of all things. A coming home. We call her “Mother Earth” for she is continuously nourishing and supporting us. She is the foundation of our physical well-being and our direct connection to universe. Ask Yourself: How do I nourish myself? Earth element therapeutics include connecting with nature, walking barefoot on the earth, eating slowly and consciously, and taking time for things that delight and nourish you. Seasons. Each element is most dominant in a particular season. The earth element, however, shows up between every season. The energy of the earth element is a gathering back and centering yourself, a downwards, grounding energetic. Organ Functionality. The stomach sits beneath the spleen, below the left side of the rib cage. The stomach’s primary function is digestion, to mix the nourishment we uptake with acidics from the stomach to pass substance to the intestines. Mounting evidence suggests the essentiality of the ‘belly brain’, in which emotions substantially affect the digestive and immune response process. Imbalanced Earth types typically do not nurture and nourish themselves. They can experience a Sense of emptiness and neediness, an insatiable desire to fill a void. Imbalanced earth types are often looking for something to fill them- relationships, food, alcohol/drugs, TV, shopping, work. Physical symptoms of imbalance: Eating patterns can be dysfunctional, as earth types tend to have issues which center around food and relationships. Sugar/sweet cravings, overeating, bloated belly, Candida are all symptomatic of earth element imbalance. Emotional symptoms of imbalance: Anxiety, Clinginess, Possessive in relationships, craving of sympathy. Balanced Earth types are grounded, present, and connected. When they walk into a room, you can sense the way in which they are inhabiting their bodies fully. Balanced types understanding which activities and experiences are nourishing, as opposed to which ones temporarily fill a desire. They are nurturers, but balance giving with receiving. The stomach meridian begins at the cheekbones, traces along the jawbone, and spans across the collarbones. It then descends the front line of the abdomen, through the groin creases, and all the way down front of the thighs and kneecaps across the top of the foot, where it ends at the second toe. A Yin Yoga practice to support and balance earth energy in the system would incorporate aspects of the meridian to lengthen and lubricate the connective tissue among those regions of the body. WANT TO PRACTICE WITH KALI? Learn more about her upcoming 5 Element Yin & Restorative Yoga Teacher Trainings. Yin Yoga is a practice that seeks to mindfully lengthen and lubricate the connective tissues and approach Equanimity in the subtle and emotional body. Practicing the methods of stillness, mindfulness, and loving kindness, Yin Yoga empowers practitioners to coax Prana into particular healing and rejuvenate pathways. The yin meridians of the fire element run from the chest down the arms and into the hands. They relate strongly to touch, intimacy and connection. Its through touch that we affirm friendship, warmth, communicate our live, give and receive, share. 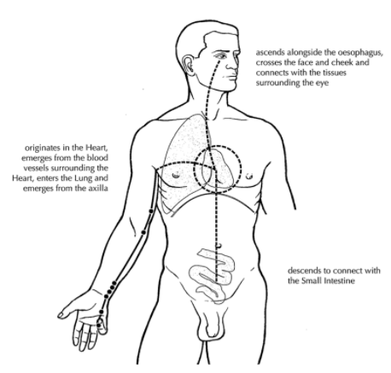 An inner pathway penetrates the tongue and extends down through the diaphragm to connect heart center with lower energy centers that empower sexual responsiveness. Ask Yourself: What engenders an authentic feeling of expansive joy in my heart? How do I deal with disappointments and disillusionments in relationships – do they help me to mature, or do I shut down? Organ Functionality: Oxygenation- Dark red blood low in oxygen enters the right atrium of the heart and pumped outward into the lungs. Bright red oxygenated, pranic blood then returns from the lungs into the left atrium of the heart and distributed to the entire body. Heart is the gateway to pranic distribution of the entire system. Notice how you feel when you breathe from the heart, with compassion and love, versus non-integrated breathing that may feel staggered and poorly distributed. When fire is in balance, fire types are loving, spontaneous and joyful. Life is full of laughter, fun and creativity. Feeling of being in sync with the self and others. Emotional warmth and radiance. Much of the freedom we experience hinges upon the openness of the lung meridian- easy breathing as the chest rises and falls, spread proud openness across the collarbones, space to move around with the arms and also how much is within arms reach, what type of support can we find if we ask for someone to lend a hand. Through the lungs, we distribute oxygen to every cell of the body, and remove CO2 from blood to expel it. The lungs are designed to move things through the body: inhales beckon the kinetics of the system to gather back into itself, consolidate. The exhales support a letting go and a clearing out. Resisting change by trying to hold on to something, or clinginess, is tension forming. Tension blocks the flow of energy through the body and the flow of feeling through the psyche. Full chest breathing stimulates sympathetic nervous system supplying the body with energy for action. Deep, slow abdominal breathing activates para-sympathetic to relax body and mind. Often to suppress emotion we hold breath, tighten the throat, clench jaw and belly-all to prevent feelings from arising. Season: Fall (in the spirit of letting go & clearing, like leaves falling off a tree, all which is peripheral falls away as the Prana is reserved in this season for the central channel or trunk of the tree. The central trunk organizes its nutrients so that it’s ready to distribute them and flourish in the spring. Autumn is the turning point from the yang of summer, back toward the yin of winter. Everything begins to slow down, dry up and draw inward. Autumn is the time of release and decay. Trees drop their leaves, flowers wither, and all of the dried up plant byproducts are absorbed by the earth to become minerals and nutrients that will be used for future growth. It is the time for letting go of what is no longer essential, slowing down, drawing awareness inward and storing up what is needed for winter. Metal element out of balance is blocked from fully expressing oneself. Instead of being proud we have unrealistic unbending rigid expectations of ourselves and others- a perfectionist paradigm. Metal types can have a difficult type discerning what is of value and of service, and what to let go of. Sometimes this is demonstrated in difficulty in letting go of emotional pain and dealing with grief.. Emotional symptoms hopelessness, pessimism, prolonged grief, isolation, remote distant behavior, inability to let go, hoarding. A balanced metal element constitution allows the process of grief and letting go of the past in order to gain wisdom. They release attachments and form new bonds without fear of loss. The key lesson for metal is to let go of seeking and attachment, forgiving oneself and others and releasing the past. Becoming present and grateful for what’s arriving here and now. Affirmation: I am at peace with impermanence. A metal element practice is one to support the lungs in its optimal functioning. As the energetics are a clearing and transformation, releasing the older, we can use twists as a cleansing technique which helps us approach the center line more aptly, arm and heart openers to lengthen and lubricate the metal element meridian and spread wide the ribcage, and side body lengtheners to make more space for the lungs. Yin Yoga is a practice which encourages a softening or surrendering of activity and an observation of present moment awareness. Integrating the Chinese Five Elements into the practice enriches the paradigm of Yin Yoga as a healing modality, as we are each an embodiment of Earth, Fire, Water, Metal & Wood. During circumstances of imbalance, we can utilize the wisdom tradition of Yoga Asana to organize the skeleton and relax the musculature in specific ways which awaken and enliven gentle self-inquiry and a lubrication of the connective tissues and pathways for immunity, longevity, and vitality. The wisdom of water is its incredible strength, it carves rock and shapes the entire earth, but without force. Water element allows for adaptation to all of life’s changes, challenges and stresses. Like the flow of water, a balanced practice empowers us to govern emotions, rather than letting emotions govern us. This is sometimes called ‘radical impartiality’: water energy enables us to act effectively in regard to a problem despite emotional responses, from a place of stable clarity, and to continue to advance or retreat appropriately. To act consciously, rather than react unconsciously. Allowing feelings to be there, without suppressing or indulging them. Do I know when to stand my ground and when to surrender? Am I making choices which deplete my vital energy, or allowing spaces to replenish and revitalize my system? Each element is most dominant in a particular season. The winter, which is also the season most dominant in YIN energy, is also the home of the water element. Just as a bear hibernates in winter, the water element of this season asks us to engage in renourishing activities. Located below the lowest ribs on the back body, the kidneys are responsible for waste removal and filtration of blood. Kidney energy effects all of life’s processes from birth onwards. It is essential for growth and maintenance of general vitality, creativity, youthfulness, and sexuality. Kidney energy controls the Chi, or essence, and thus gives stamina and vigor to the entire bodymind. Excessive reactivity and perpetual state of emotional responsiveness (opposite of equanimity) highlight an imbalanced water type. Fear, stress and anxiety drain the system of motivation, so they are unable to cope with issues that arise. They tend to create stressful schedules and unrealistic priorities to take on too much beyond their capacity. A continuous build-up of stress and a consistent strain on adrenal glands and nervous system can drain them. Physical symptoms of imbalance: Kidney deficiency is more apparent in winter. If fatigued or unbalanced, water types are less able to stay warm and grounded and nourished when the water element is intense. Weak kidney chi can manifest as yellow palor to the skin, blue bags under the eyes, a craving for salty food, and aversion to the cold. Emotional symptoms of imbalance: Fear, panic attacks, phobias, feeling overwhelmed. They trust in the flow of life. They are typically morning people, as they awake full of vigor. They are motivated and thus flow around obstacles with a skillful balance of effortlessness and determination. 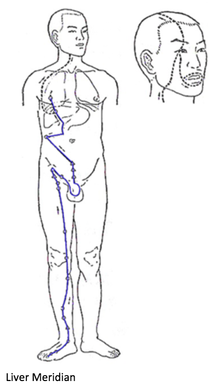 The water meridian or the kidney channel begins at the sole of the foot and curls around the inner ankle before ascending up the inseam of the back of the leg. As it reaches through the inner groin it branches up the front of the spine and chest to end just below the collarbones. A Yin Yoga practice to support and balance water element typically tends to emphasize vitality support. As the kidneys filter toxins from the blood, our aim in a water practice is to support the flow of blood and Qi uninterrupted, alongside front and back bends and lengthening of the inner leg line. TRY SOME OF THESE WATER ELEMENT POSTURES! The wood element governs our relationship to order, planning, and control. Feelings of frustration may be the penalty for not growing into and asserting out whole self. Wood energy also involves our physical and mental flexibility. If a constitution finds imbalance in the wood element, the result is stubbornness, and narrow-mindedness like a rigid branch that cannot bend but will break instead. Wood element is a delicate balance of asserting and expressing our truths and preferences while accepting other points of views and processes without judgement. A wood element practice is one to support the liver in its optimal functioning. The liver is the largest organ in the body, weighing between 3-4 pounds. 2.5 Pints of blood flow through the liver each minute, freshly oxygenated blood from the heart and nutrient rich blood from the stomach, spleen, and pancreas. The liver secretes various substances required by the body including glucose, proteins, vitamins and fats. There are more than 500 known functions carried out by the liver, including conversion of carbohydrates, processing of protein, storage of iron, assembly of amino acids, destructions of toxins such as nicotine and alcohol. The liver is one of the most congested of all organs in modern day - excess fats, chemicals intoxicants, and denatured foods must all be processed by and through the liver, which need to be in prime working order to filter and detoxify our bodies. A branch of the liver meridian extends into the eyes and governs our physical and psychological vision, being in tune with a vision for our life's purpose. Wood energy is responsible for seeing this vision clearly and ordering and planning the steps to make our visions a reality. One of the first signs of disharmony in liver occurs on emotional level- anger, frustration, impatience, resentment, and explosive behavior. If these emotions not processed, it can lead to disharmony or disease in the system. Learning to deal with frustration and anger is an essential part of learning to assert and express oneself. Without self-awareness, assertion can become aggressive, or assertion can dwindle to be non-existent as we shrink from aspects of self we are not entirely comfortable with. Often a wood imbalance manifests as being “nice”, masking our true feelings, stifling our truth. Season: Each element is felt most strongly during a particular season. The wood element is most potently alive in Spring; think of the detoxification processes of the liver akin to a ‘spring cleaning’ where the kinetics of the meridian assume the movement and shifting of stagnation, the clearing out of accumulated debris and tension. Imbalanced Wood types tend to suppress emotions, staying quietly rigid and unflexible in their views and behavior. Likely to have episodes of explosive reactivity, stubbornness, irritability after suppressing for so long. 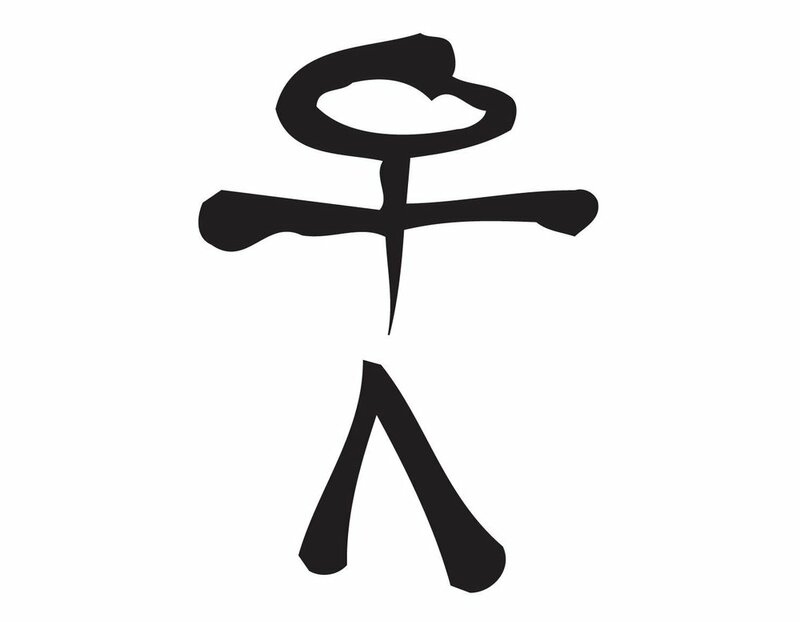 Wood imbalanced type can be timid and lack courage to express oneself fully, or on the opposite side of the spectrum can be overassertive in their opinion and the attempt to obtain what they want. Anger and resentment can result from both patterns. Physical symptoms of imbalance: yellow eyes + skin, stiffness, arthritis, tired eyes/weak/blurred vision/light sensitivity, migraines, weak nails. Balanced Wood: Confident and intuitive, patient and able to express emotions as they arise. Able to express their personality instead of assert themselves, smooth and relaxed. The key lesson for wood is to express oneself and allow growth with patience and compassion and fully accepting themselves exactly as they are. A wood element practice is one to support the liver in its optimal functioning. As the energetics are a moving, shifting stagnant energy, we can use twists as a cleansing technique which helps us approach the center line more aptly, and hip openers to clear the debris. 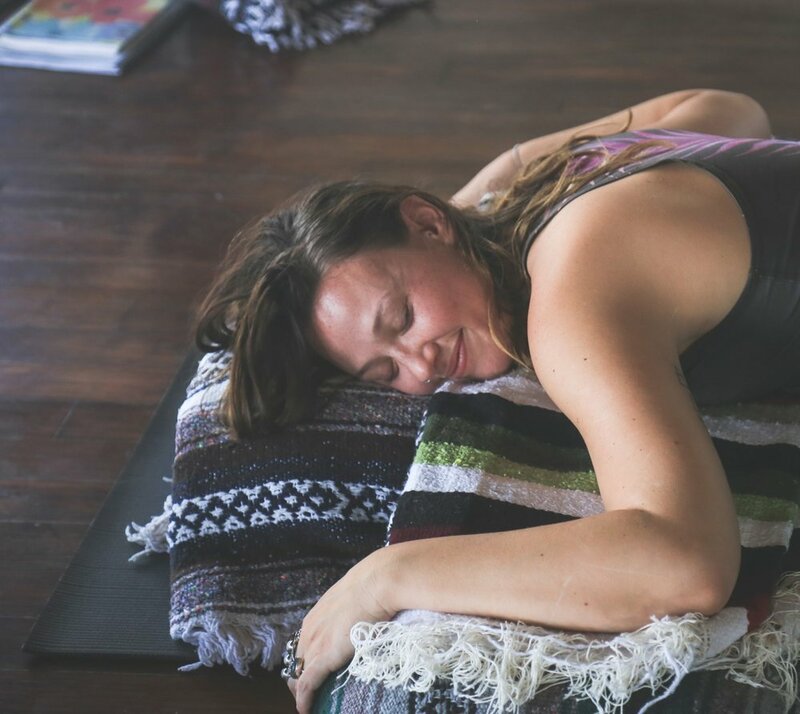 International yoga teacher Kali Basman (kalidurgayoga.com) enriches the paradigm of Yin Yoga to integrate distinct aspects of Self into an innate wisdom practice to awaken a rich inner life and radiate with ritual. Her offering honors Yin Yoga as a tool to surrender to our intrinsic wholeness. On the textured path of mindful healing, Kali is celebrated for her integration of the 5 Elements and Chinese Meridian Theory with self-inquiry, embodied Anatomy, Buddhist Philosophy of Equanimity, and sharp intellect. Want to practice with Kali? Learn more about her upcoming Yin & Restorative Trainings.